Male: Orange breast, black head and back. Female: Similar to the male. 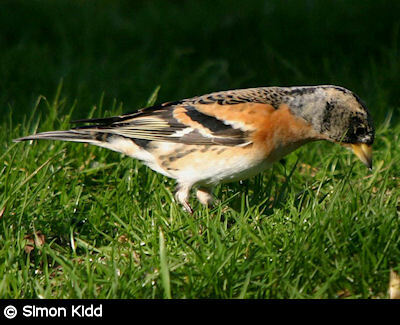 The Brambling is a finch whose plumage changes considerably between summer and winter. In the winter, it has a black head, orange breast, white rump, and its upper parts are mainly black but mingled with orange. 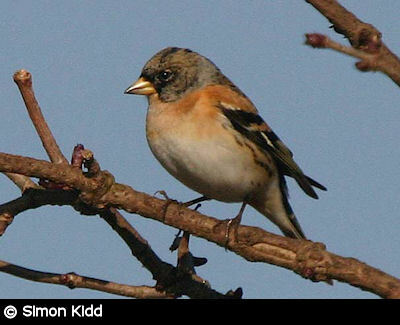 At first glance they are very similar to the Chaffinch, which is unfortunate as we are most likely to see Bramblings at wintertime with flocks of Chaffinch, though the white rump of the Brambling is a distinguishing feature. In the summer, the male has a glossy black head and back, and orange on its breast that extends round its back in a band. The female's summer plumage is the same as in the winter, but brighter. Juveniles are similar to females, but the latter have dark mottled head, and grey cheeks and neck. The Brambling's wheezy song is similar to that of the Greenfinch, but its pitch varies less, and is rarely heard in Britain. Their natural diet is beech mast, seeds and berries, and insects in the summer. While breeding they feed mainly in the trees, but at other times on the ground. In the winter they often form large flocks and feed in agricultural areas and beech woods. The nest is built by the female and usually in a conifer tree close to the trunk. The deep cup is built from moss, grass and hair, lined with feathers and wool, and decorated with bark and lichen. Most breed in Scandinavia through to Siberia, and visit Western Europe only in the winter. The smooth, glossy eggs are greenish to brownish with dark brown markings, and approximately 19 mm by 15 mm. The female incubates the eggs by herself. After the young hatch, they are fed by both parents. 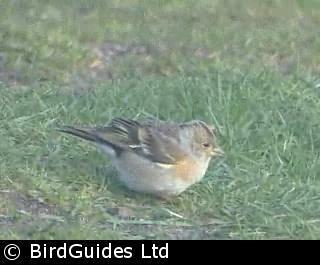 Bramblings winter in Britain and Ireland. A Medium BTO Alert has been issued because of the low numbers of breeding birds.